Headed to Las Vegas for the first time? Can I please come with you? I’m a great guide! (And a decent craps player). No? Well then how about a list of must dos in Vegas for first timers? You’re in luck – and you haven’t even started gambling yet! Here’s my Las Vegas guide for first timers, as well as a few Las Vegas tips for first timers to the city. You’ll probably want to buy one of these or treat yourself to some cute travel accessories from our shop! I won’t even ask for a cut of your winnings. Both properties are well-located right in the center of the strip. Both have great on-site amenities including a spa, pool, restaurants, and shopping. So you can have an incredible trip and experience much of what Las Vegas has to offer without ever leaving your resort. You’ll thank me when you see how long the cab lines can get! Both hotels are relatively new, so the in-room technology is SUPER COOL (I won’t spoil the surprises). Vdara is also non-smoking, so if that’s important to you – Vdara is your spot. When choosing your hotel for your first time visit to Vegas, make sure to factor in the costs of going to and from your hotel to other destinations. Sure, you might save $25/night staying off the strip, but you can easily spend that in cab fare getting around the city. What I love about Las Vegas is that it can be anything that you want it to be. While most people head to Vegas to gamble and party like there’s no tomorrow, there’s also SO MUCH to do that is exactly the opposite. Incredible restaurants, terrific shopping, world-class shows and entertainment, and spas for days. So no matter what you’re up for – Las Vegas truly has something to offer for everyone. Stay in a hotel with amenities that you’ll use, including restaurants, shopping and spa facilities. Check out my recommendations above for suggestions on great hotels for Vegas first-timers. Going to and from places in Vegas during peak times can take FOREVER (long cab lines, traffic on the strip, etc.) so it can be nice not to leave your home base. One more Las Vegas tip for first timers – go mid-week if you can! You’ll save a TON on hotel costs. And if you’re worried that the city won’t be as exciting in the middle of the week – you’d be surprised what sort of trouble you can cause in Vegas on a Tuesday. There’s so many things to do in Vegas for first timers that just figuring out a game plan can be completely overwhelming. That is why I’ve pulled together all of my Vegas favorites into a 3-day Las Vegas itinerary for first timers. If it’s your first time in Vegas, you’re probably itching to see the Strip! So once you arrive, head out on foot to stroll the Strip. Bonus points if you decide to take a 3-foot-tall frozen drink with you. Check out some of the more interesting theme hotels on the Strip – either the New York New York, the Bellagio, the Cosmopolitan, or the pirate show at the Treasure Island. Grab pre-dinner drinks at the High Roller Ferris Wheel at the Linq for an amazing view of the Strip as the night lights come on. Having your own bartender will make for a pretty fun ferris wheel ride! For dinner, head to the nearby Paris hotel to hit up Mon Ami Gabi – my favorite restaurant in all of Las Vegas! If you can, try to sit outside so that you have a perfect view of the fountains at the Bellagio Hotel. After dinner, hit up a show (make sure you buy your tickets in advance) – I highly recommend Love, O, or Le Reve. Or there’s always Britney! Grab room service or a quick coffee breakfast so you have time to enjoy the entire day! Head out to the pool early to snag a pool chair and soak up the sun for a few hours. And I mean EARLY. Some of the pool chairs will get claimed with towels starting as early as 7am! As long as you’re out to claim a chair by around 10am – you should be fine. When it comes to pools in Vegas, there’s two options: chill or party. Almost all resorts have a “chill” pool option – with plenty of lounge chairs, drinks on repeat, and a bit of a see-and-be-seen scene. If it’s in your budget, consider renting a poolside cabana where you’ll have a dedicated space for your group to gather, as well as plenty of shade. Cabanas are a great option for a bachelor/ette party – you can be as relaxed (or not!) as you want to. 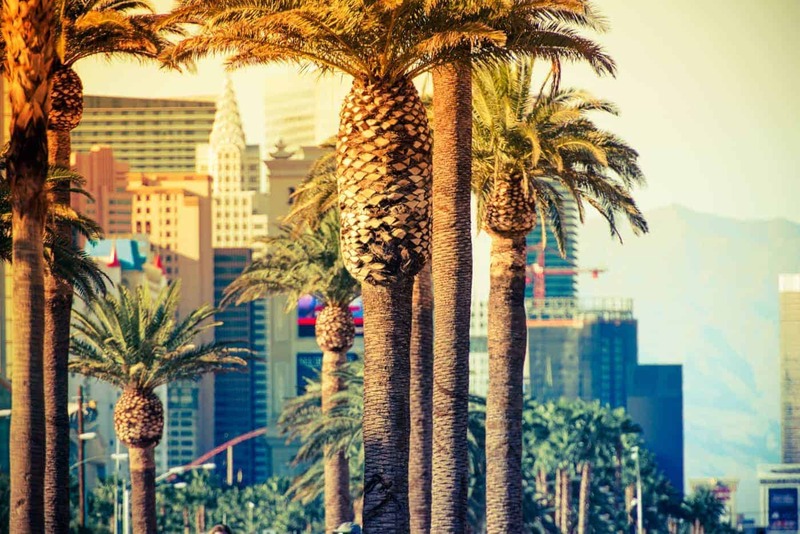 If you’re looking for more of a poolside party scene, Las Vegas has some pretty incredible daytime pool parties that are more like clubs than they are pools – and they’re worth experiencing at least once – and more than that, if it’s your thing. If nothing else, the people-watching will be AMAZING. The best ones in my book are the Hard Rock Hotel’s Rehab (the original day club in Vegas and still going STRONG), Mandalay Bay’s Daylight or Tao Beach at the Venetian. For the afternoon, stroll through the shops in the Grand Canal and grab some gelato while you’re at it. The whole scene looks so much like Venice that you may feel like you can check that city off your bucket list! 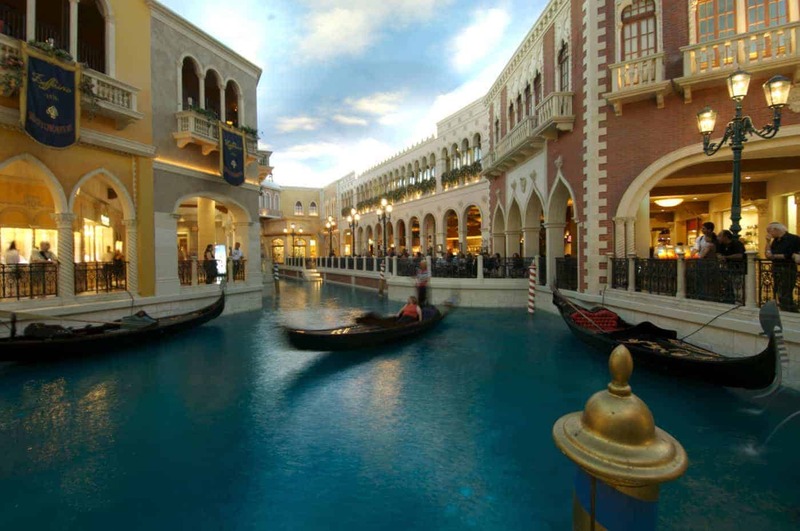 You can even take a gondola ride through the canal, complete with your very own singing gondolier (be on the lookout for marriage proposals!). If you’re still hungry post-gelato, a pizza at Otto’s is about as close as you can get to Italy without actually going there. If shopping isn’t your thing, spend the afternoon doing an activity that you can only do in Vegas. A few of my favorites are indoor skydiving or ziplining through Freemont Street. Head back to your hotel to put on your Saturday-night-finest, and then head out for the evening! If it’s your first time in Vegas, you can’t miss the Cosmopolitan hotel. Start your night with drinks at the Chandelier Bar at the Cosmopolitan, a 3-story bar where you’re literally having drinks INSIDE a chandelier. While you’re there, you HAVE to try the secret cocktail that you won’t find on the menu – The Verbana. Talk about tingly. Afterwards, head to dinner at Beauty & Essex (also in the Cosmopolitan Hotel) then to Marquee, the nightclubclub at the Cosmopolitan. Bottle service for the win. This morning is the perfect time to indulge in one of Vega’s famous buffets. The buffets are EVERYWHERE – but there’s only a few that are worth the price tag. My favorites are The Buffet at The Bellagio, The Buffet at the Wynn, and the Bacchanal Buffet at Ceasar’s Palace. If you’re game post-breakfast, I highly recommend checking out the natural beauty in and around Las Vegas. The scenery is just stunning, even though it tends to be overshadowed by the Strip, which is why I recommend it to first time visitors to Las Vegas. 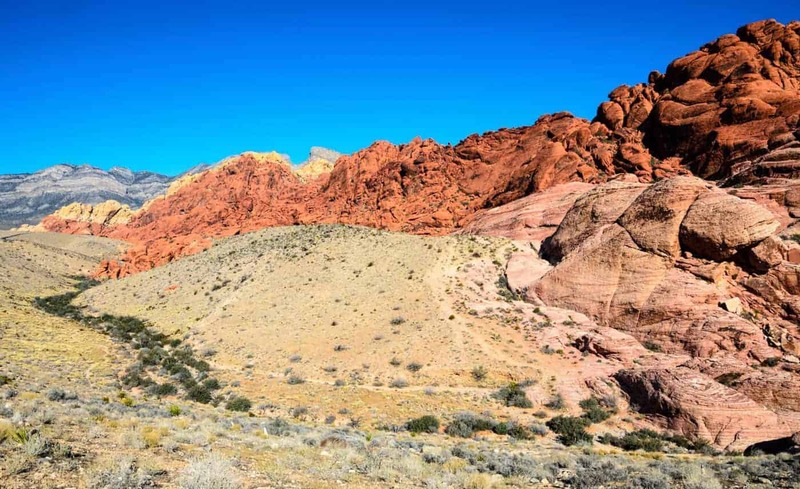 Try either a helicopter tour over the Grand Canyon and Hoover Dam, or if you’d rather burn off that buffet, the hiking trails at Red Rock Canyon are unbelievably beautiful. 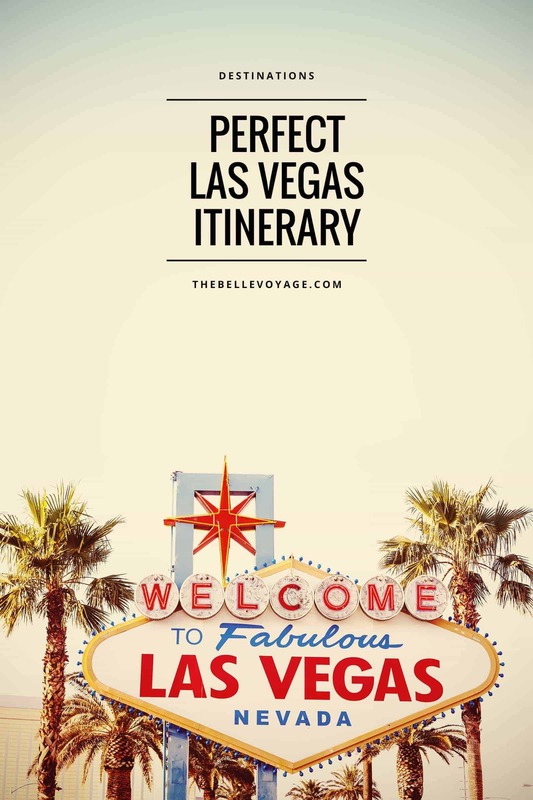 There You Have it – A Perfect Itinerary for Las Vegas First-Timers! If you need help packing for Vegas, I’ve also written an entire blog post on what to pack for a trip to Las Vegas. 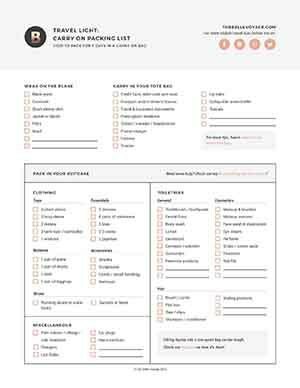 You can also check out my best packing tips for women.